It's a great pleasure to join you today for the luncheon of the Belt and Road Summit, our annual flagship event on the far-reaching Belt and Road Initiative. The theme of this year's summit is "Collaborate for Success". During the morning session, senior government officials from the Central Authorities have updated you on the latest thinking and direction of the Belt and Road Initiative. You have also heard first-hand successful experience of some projects that are being implemented along the Belt and Road, the differences these projects are making to the economies, as well as the tangible benefits that these projects are bringing to the local community. Before we proceed to the afternoon sessions, I would like to take this opportunity to share with you what Hong Kong can offer, for you to capitalise on the massive potential down the Belt and Road. I was told that lunch will only be served when I have finished. So I promise I will keep my remarks brief. For decades, Hong Kong has been the pivotal gateway connecting China and the world. We are strategically positioned to serve as multiple services platforms for the Belt and Road. Firstly, as one of the world's leading financial centres and China's international financial capital, Hong Kong is the platform for capital formation and funding. Hong Kong's strengths and expertise in financial services need no introduction. Our deep liquidity, premier financial infrastructure and comprehensive options for raising capital, from the traditional IPOs and loan syndication to bonds and the more sophisticated Islamic sukuk, can meet the financing needs of any mega Belt and Road infrastructure project. In terms of IPOs, Hong Kong has been ranked number one globally for five years in the past nine years. Our Securities and Futures Commission is doing its part as well by setting out eligibility criteria for infrastructure project companies looking to list on our stock exchange. These criteria provide a clear pathway for companies reaching out to Hong Kong for equity and debt financing. Secondly, Hong Kong is the platform for high-end professional services. Our world-class professionals in engineering, architecture, urban planning, surveying and consulting have the experience and knowledge to lead the Belt and Road projects, in ascertaining project feasibility, in implementing the project and in operating the infrastructure. We know very well that legal, regulatory and political risks can undermine the feasibility of a project, and that risks in construction and cost overruns will negatively impact a project's profitability. Hong Kong's deep pool of multicultural talent in law, accounting and finance can help manage these risks, by conducting legal due diligence, structuring the best deal through a combination of financial engineering as well as insurance and reinsurance. What's more, Hong Kong is the perfect hub for the Belt and Road's legal matters and for resolving business disputes. Under the unique "one country, two systems" arrangement, Hong Kong remains a common law jurisdiction. The international community is familiar with Hong Kong's common law system, underpinned by an independent judiciary as well as a very robust intellectual property rights protection regime. Arbitration awards made in Hong Kong are enforceable in over 150 jurisdictions including the Mainland of China. Thirdly, Hong Kong is the platform for you to find the right partners, no matter if it is an equity partner, or a partner for the operation and management of infrastructure. For example, both the Hong Kong MTR Corporation, the operator of Hong Kong's efficient public railway system, and the Hong Kong Airport Authority, which runs one of the world's busiest airports, have vast experience in operating infrastructure assets outside Hong Kong. Companies expanding in the economies along the Belt and Road will be exposed to challenges of dealing with currency and interest-rate fluctuations. Hong Kong is an ideal choice for setting up a corporate treasury centre, for centralising a corporation's financing and liquidity management in the region. We provide tax concessions for corporate treasury centres. Their qualifying profits will be taxed at only 8.25 per cent. At the same time, we will continue to expand our network of free trade agreements, trade promotion and protection agreements, as well as double taxation agreements, in order to better enable such headquarters and corporate treasury centres to be set up here to leverage the extraordinary opportunities in the emerging markets along the Belt and Road. Before I conclude, I wish to highlight the exciting prospects for Hong Kong in the Guangdong-Hong Kong-Macao Bay Area development, a national development strategy of China. Linking nine Guangdong cities, together with Macao and Hong Kong, the Bay Area counts a combined population of 68 million and a collective GDP worth US$1.5 trillion, which is comparable to that of Australia or Korea. In light of the tremendous synergies of Hong Kong and the vibrant tech sector in Shenzhen and advanced manufacturing bases in other cities in the region, we believe the Bay Area possesses the combined advantages of the New York Bay Area and the San Francisco Bay Area. For our guests coming from overseas, I would strongly recommend you to spend time to uncover the tremendous potential that the Bay Area development may bring to you. Ladies and gentlemen, I wish you all a rewarding Summit. 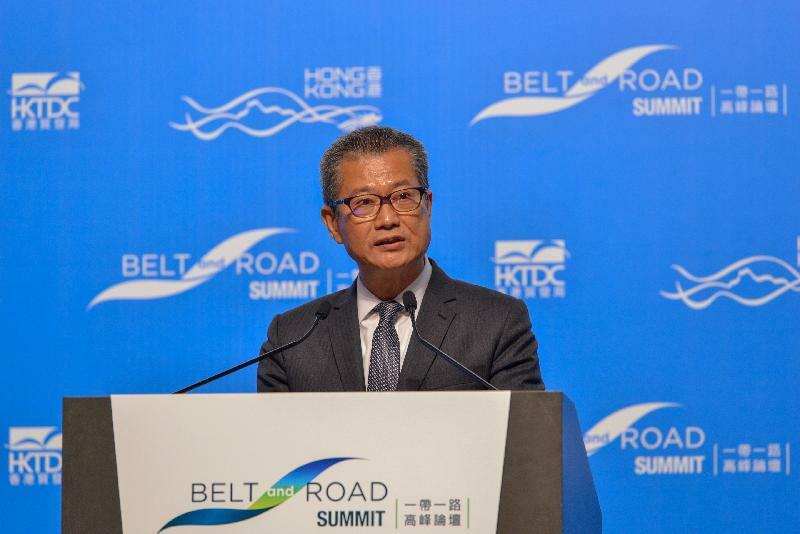 And I encourage you to make good use of Hong Kong's multiple services platforms and many compelling advantages in realising the limitless Belt and Road possibilities. We always stand ready at your disposal. I can see that your lunch is on the way, so thank you and bon appétit!